JOHN KING: Some would say if you look at the Bible, homosexuality is wrong. Some use the term evil. You say gays are welcome in your church, even though you might not agree with their lifestyle. How do you deal with that as a person and as a minister and someone who many in your community look to for guidance? JOEL OSTEEN: “Well, the way I would – I would deal with that is that I think the worst thing we could do is say, “Well, this group can’t come, because they don’t believe exactly like me.” I want them to come to be able to receive help. That would be like saying that somebody has a drug addiction. You know what? I don’t believe that’ right. I believe that’ harming your body. But you know what? Come to our church. I want to give you help. I want to give you encouragement. 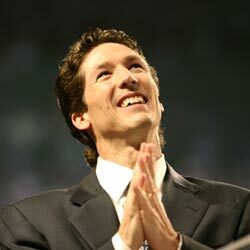 Osteen is a televangelist who runs a Christian church out of a former Houston basketball stadium. His Jesus wants you to be rich philosophy has made him one of the most successful preachers in America. He is not known as a rabidly anti-gay preacher — so his remarks were hurtful and disappointing, says Truth Wins Out.